Combine the potatoes, oil and salt, shape into four 5-mm-thick squares on a baking tray lined with baking paper. Approx. 20 mins. in the centre of an oven preheated to 220°C. Mix together the asparagus, oil and salt. Remove the roesti from the oven, place the asparagus on the roesti squares, put the cured ham next to the roesti, cook for a further 10 mins. Boil the wine, vinegar and shallot in a pan. Turn down the heat, reduce the liquid to approx. 1 tbsp, strain into a thin-sided bowl, leave to cool. Add the egg yolk to the reduction and mix well. Suspend the bowl over a gently simmering bain-marie, ensuring that the bowl does not touch the water. Beat the mixture with a whisk until light and fluffy. Reduce the heat, gradually add the butter while stirring, continue to stir until the sauce becomes creamy. Stir in the cheese. Remove the bowl, season. Bring the water and vinegar to the boil in a wide-bottomed pan, reduce the heat. Crack the eggs one at a time and carefully slide into the simmering water, cook for approx. 4 mins. 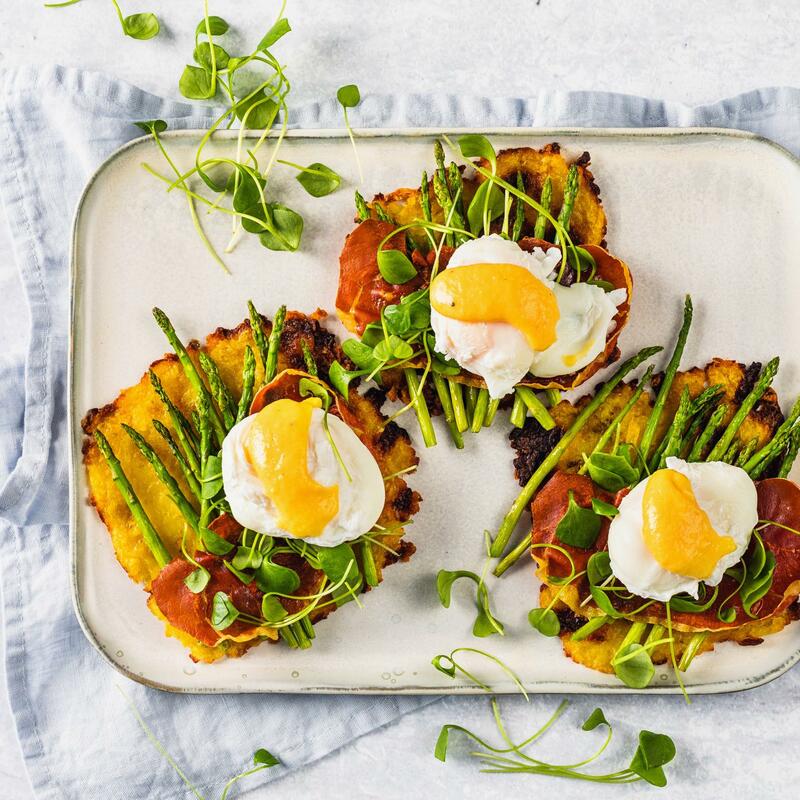 Place the crispy cured ham chips on top of the asparagus roesti, then top with the purslane, poached eggs and sauce.